Small - £12.99 Only 6 left! X-Large - £12.99 2X - £12.99 3X - £12.99 Only 4 left! Wow, being a Mr. Meeseeks must be rough. With a single press of a button, they’re willed into existence just to perform a single task. Until that task is completed, they live in a constant state of agony and when they finally accomplish their singular goal, they’re erased from existence in a glorious blue explosion. It’s not a sort of lifestyle that we can recommend for anyone to actually try to emulate! This Rick and Morty Mr. Meeseeks t-shirt, on the other hand, is the great with a capital G! 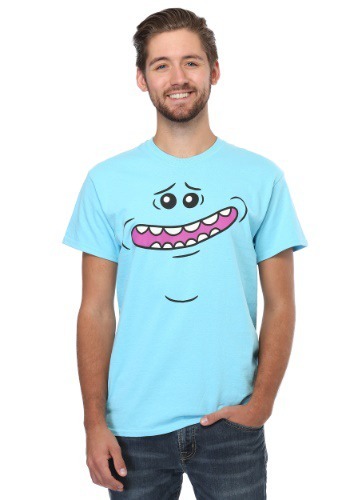 You see, with this officially licensed shirt you get to look like one of the wacky characters from the show, but you don’t have to explode and you don’t have to live a life of constant agony. You can wear it for everyday occasions or you can use it as a quick and easy costume for your next party. And again, no explosions! What a deal!